The newest feature on Hyperspace at the The Official Site is the 6th installment of Lucasfilm’s making of Episode 3 series. Check it out here. Here it is the end of April and we’re talking about Hallmark Christmas ornaments for 2004. 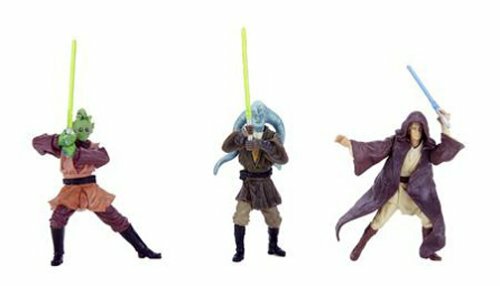 Actually, Hallmark has had some brief information about these for a while, but Star Wars.com has all the info on the upcoming 2004 ornaments. 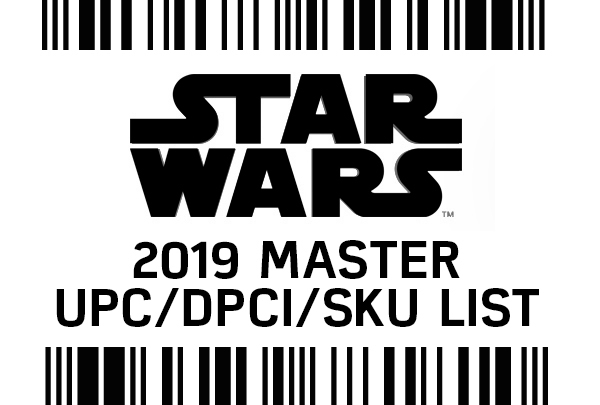 We’ll be getting a Star Destroyer (with Blockade Runner), Chewbacca with C3PO from Empire, “A New Hope” One Sheet (poster), and Anakin from AOTC. All the Star Wars LEGO’s are at least 25% off at Amazon.com, plus here are a couple that are marked down quite a bit. And here are some NEW announcements! The Official Site has updated with all the 411 on Disney’s Star Wars Weekends, including a list of all the exclusive merchandise. Get your wallet, or at least your plastic ready before clicking on over. There’s lots of great stuff. Check it out here. We’ve just updated to bring you images of the upcoming Attakus Darth Vader 2 and Chewbacca straight from Attakus America.Check them out here. This week’s photo is titled “Jedi Dispenser” which shows (highlight to read)Master and Apprentice working their way through the rusty innards of a Trade Federation Cruiser. Today’s featured auction was sent in by YakReader Luke, and though the item is not a liscened incarnation, it still offers an interesting discussion here. Gentle Giant mini busts are popular with collectors due to their small size, wonderful details, and affordable retail pricing. If that weren’t enough, there have been convention, website and MBNA Mastercard exclusive busts for collectors to attempt to acquire. This particular auction pertains directly towards the chromed MBNA Exclusive busts of Vader and Jango Fett. The seller of this auction has bought this Boba Fett bust chromed by artisans in Japan, to be exact 50 of these busts have been custom chromed. The bust does look very cool in chrome, but please be aware that this chromed version is not liscened and is not a super rare exclusive. As with all autions on Ebay it is always a good rule of thumb to carefully read the entire description before bidding to avoid any confusion or disappointment. Entertainmentearth.com now has the new SW Ultra Figure Asst. 3 cases in stock. Stop over if you are looking for these. Star Wars Ultra Figure Assortment 3 Case. Includes six individually packaged ultra figures: 2x Ewok with Attack Glider (NEW), 1x Obi Wan Kenobi With Force Power- Kamino Showdown, 1x General Rieekan with War Room Map, 1x C-3P0 with Escape Pod, 1x Jabba’s Court Denizens Three Pack (B’omarr Monk, Bubo, Wol Cabasshite) (subject to change). Master Replicas Has Another Hit On Their Hands! Master Replicas has today launched their Lord of the Rings Line. While we wouldn’t normally talk about that “other” trilogy, they have really outdone themselves on some of these items. Most incredible is the new Sting FX sword. Those of you that have seen Fellowship of the Ring (and who hasn’t now? ), Frodo’s sword Sting glows Blue whenever Orcs are around. Master Replicas has a reproduction of the sword that actually glows blue. I personally can’t wait to get one! There are 3 other collectibles from LOTR available as well – Gandalf’s Staff, The Light of Eärendil and the One Ring. Collectors Society Members can order today at Master Replicas , everyone else can order starting tomorrow. After Toy Fair this year, we posted answers to many popular questions on our website. Because we received positive feedback, we will be complementing our regular updates with Q&A. Q: Hasbro announced in Star Wars Insider that they are releasing the Sandcrawler this year at Target (in the US). However, an International retailer has announced that the item is cancelled. What is the story with this item? A: Since the article for the Insider went to press a couple of months ago, Target has decided not to carry the item. We have been discussing the item with other retailers and are hopeful that we will still be able to find a home for the Sandcrawler in 2004. If it is placed in the US, then we anticipate that it will also be sold in other countries as well. However, if it is not sold in the US, then it is unlikely to be sold anywhere. We will announce new plans on our website as soon as they are confirmed. Q: What is the plan for the “vintage” 3-¾ inch line of figures? A: First, we’d like clarify what we mean when we say “vintage figures.” The line consists of 12 entirely new 3-¾ inch figures, with enhanced deco and/or articulation. The “vintage” refers to the packaging artwork. These figures will feature reproductions of the original packaging from the 70’s and 80’s. These are part of our Original Trilogy Collection to commemorate the release of the classic trilogy on DVD this September. In terms of distribution, we expect the line to be carried by all major toy retailers. While we do not disclose production quantities, we caution fans against Internet rumors. We will ship these figures in multiple ratios to try and ensure that the most popular figures are available throughout the Fall. STAR WARS New 2004 Figures ON SALE! Price drop on 6 recently released figures! Choose from Dengar, Bossk, Dutch Vander Gold Leader, R2D2 Sail Barge and Battle of Yavin TIE Fighter Pilot for just $8.95! Check them out here! I just noticed today in my new issue of Previews magazine from Diamond Comics a new book coming out in August from DK Publishing. The title is Inside the Worlds of Star Wars. It is very similar to their other “Inside the Worlds…” books, where there are cutaway drawings of all of the environments from the Star Wars Movies. This one focuses on the Classic Trilogy. Inside the Worlds of Star Wars is currently available for preorder from most comic book stores, or click the link above to order from Amazon and save yourself $6 off the list price of $19.99! This week’s Falcon Favorite is a very special one, as it is the last favorite item sent in by you the readers, to be featured here each and every week. A great story and a great droid that is useful for keeping everything nice and cool at a hot summer BBQ, thanks Joe! I have really enjoyed this feature and I also want to thank everyone who sent in photos of their favorite items and for all the great stories that were shared. for only $14.99. Its a great set to get the kids started into these Playskool sets. They also have the Naboo Fighter ($14.99), the Millennium Falcon ($29.99), and “Rampaging Reek” ($7.99) available as well. Lucasfilms Gets Fan Club Back! In a great announcement today, Star Wars.com has reported that the Star Wars Fan Club (which in my opinion has been HORRIBLY mismanaged the last few years), is returning to Lucasfilm’s control. The “new” fan club will be combined with the Hyperspace membership on the Star Wars website, plus will have plenty of other benefits! Check out the entire story over at Star Wars.com. Hasbro’s Star Wars page just updated with a brief Q & A, focused on the Sandcrawler and the “Vintage” figure line. First, the info everyone is waiting for, Target had committed to take the Sandcrawler, but has since backed out. Hasbro is looking for other partners to market it as an exclusive in the US. Unless there is a US retailer found, it will not be released overseas either. The vintage line is also clarified as new figures with added articulation/decoration on retro cards. Read it all here. Clone Wars Animated on DVD? Amazon has recently posted info regarding a possible release of the Cartoon Network Animated Series. Although not much in the way of specs are given, hopefully they will treat the set similarly to the Samurai Jack set due next week. And here are a couple of interesting items…. We’ve seen the painted prototype photos that have been floating around for a while, however some very colorful protos the upcoming Original Trilogy Cloud Car Pilot and Yoda have surfaced on Ebay. You can see Yoda here and the Cloud Car Pilot here. Features opening entry ramp and cockpit, pivoting radar dish, repair station and authentically styled interior, laser cannons that fire as they move back and forth and a flip-down panel with flashing lights! All figures store inside the playset! Includes Millennium Falcon, Han Solo, C-3PO, and Chewbacca. Requires 3 AA batteries (not included). 3x Luke Skywalker & R2-D2, 3x Princess Leia & Han Solo, 3x Darth Vader & Obi-Wan Kenobi, 3x Chewbacca & C-3PO (Subject to change). 1x Luke Skywalker & R2-D2, 1x Princess Leia & Han Solo, 1x Darth Vader & Obi-Wan Kenobi, 1x Chewbacca & C-3PO (Subject to change). Vader & Obi-Wan Kenobi (Subject to change). Obi-Wan Kenobi & Jango Fett (Subject to change). Galactic Hero 2-Pack 01 names to be determined, 3x Galactic Hero 2-Pack 02 names to be determined, 3x Galactic Hero 2-Pack 03 names to be determined (Subject to change). 1x Darth Vader & Obi-Wan Kenobi, 1x Padme Amidala & Anakin Skywalker, 1x Obi-Wan Kenobi & Jango Fett, 1x Luke Skywalker & R2-D2, 1x Chewbacca & C-3PO, 1x Princess Leia & Han Solo, 2x Boba Fett & Dengar, 2x IG-88 & Zuckuss, 2x 4-LOM & Bossk (Subject to change). A large section of the universe of vintage Star Wars collecting is craft/activity items, which I have found to be a rather difficult area to complete ( for example Lee Wards ESB Suncatchers and ESB Latch Hook Rugs ). However, the items that can be collected have a great deal of variety and fun in my opinion. Today’s featured auction is for a boxed ROTJ Jabba the Hutt activity set of Presto Magix rub down transfers. What exactly are Presto Magix you ask? They are rub-down transfers that can be used over and over again to recreate all the scenes from the movie. I can remember playing with these until the little transfers tore and wouldn’t stick anymore, they were great fun. 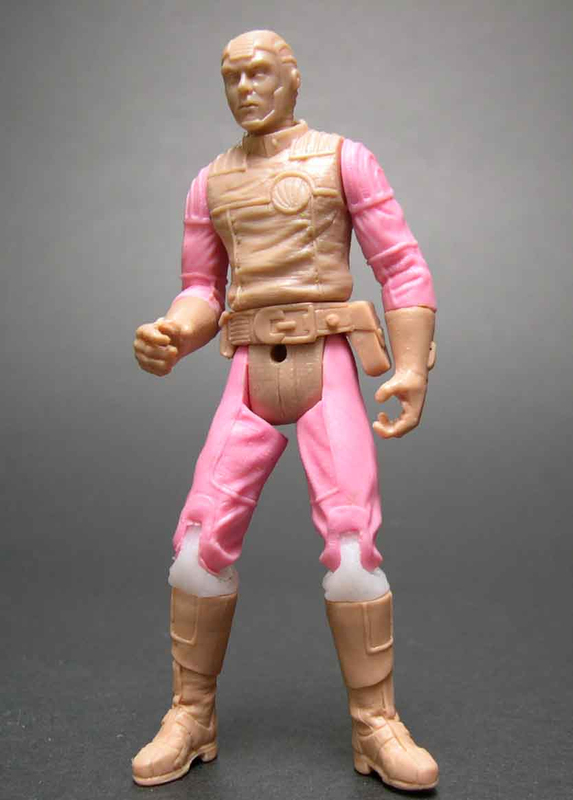 The Presto Magix are relatively easy to find today, with some of the ESB sets being a little harder to find. The prices are very reasonable and I think the artwork on the box, though cheesey as can be, is still a nice item to add to a collection. They are asking that collectors submit scans of their sketch cards so they can be added to the site and would like to make this the most comprehensive Clone Wars Sketch Card checklist, so any help you can give would be appreciated. Hasbro’s Star Wars Republic News has just updated with all the 411 on the Playskool figures line, and there are some very nice surprises. BOUNTY HUNTERS and more, check it all out here. The Attakus Collection has always provided the highest quality Star Wars statues with the greatest detail. This Clone Trooper statue stands approximately 15 inches tall and is in scale to all of the other Attakus Star Wars statues. Limited to 1500 pieces worldwide! The Official Site just announced the title of the next Ebook coming this May. The Hive will be released in the next few weeks and ties into June’s upcoming Hardcover Clone Wars Novel The Cestus Deception. If you’re a Clone Wars or EU fan, check out all the details here. Jedi John has dropped off another QNA for your reading pleasure. Please grab a drink, click over, sit back and relax. When you are done reading, please send in your own questions and John will be happy to answer them. This is one of the coolest things I have ever seen on Ebay. Anyone for a 6 Foot Long Star Destroyer? Scaled to fit Hasbro’s Action Figure line. The person selling it is in the UK, so you have to be there to bid (he won’t ship it). But, it is still too cool not to HAVE A LOOK! The new insider will be shipping in a few days and The Official Site has posted a preview. Just from the images on the cover it looks very interesting, and definitely contains spoilers. Check it out here. Vinyl cases with two sets of plastic trays in them were made by Kenner for the Vintage line, spanning across each film of the Original Trilogy. Of course collectors are familiar with the vinyl carrying cases from Star Wars, and the two different designs that were made for Empire Strikes Back. However, some collectors may not know of the much more difficult to find Return of the Jedi vinyl carrying case. The Return of the Jedi case has great artwork on it, just as the other cases before it, and is something that not every Kenner collector may own. Although today’s auction is not a complete case ( missing the insert ) and the stickers have been stuck to the trays, it is nonetheless a nice display item at a very reasonable no reserve opening bid price. This week’s photo is titled “Gold in the Face” which shows a certain protocol droid getting some finishing touches to his melon. Check your local Toys R Us stores for markdowns on the Jedi Warrior Multi-packs. My local TRU has them for the low Republic Credit price of $7.98! Great for customizers, army building or just to get that missing Arena Playset Containment Field! We have some great new arrivals and a nice sale we will be running until this weekend. 400+ ITEM SALE! – We’ve analyized our inventory levels and decided to have a sale. Prices have been reduced on hundreds of items ranging from recent transformer releases to Lord of the Rings figures from several years ago and everything in between. Be sure to check out the entire list since there is a lot of stuff including: GI Joe, Gundam, Star Wars, Transformers, Chogokin, Halo, Macross, McFarlane, DBZ, DC, Bandai & More! Also be sure to check out our sale menu! This week’s Falcon Favorite showcases an original item, something no other person has anywhere in the world. YakReader Joel from Grand Prairie, TX shares with us his unique creation and great memories. As reported on the Official Site Del Rey will release the novels of the Original Trilogy in one paperback book this fall to coincide with the Original Trilogy “Blitz” of the DVD Release and Hasbro OTC campaign. The cover features the same art as the DVD packaging which is a nice change to the same old Vader images we have seen for years. The now confirmed with image…3.75 Jedi Council Scene II is available for pre-order. This is due July 20th. You can now Pre-Order the Endor Ambush 4-Pack at Amazon.com. The Star Wars Endor Ambush 4-Pack includes a Star Wars Speeder Bike, Biker Scout Trooper, Han Solo in Endor Trenchcoat, Endor Rebel Soldier, Wicket the Ewok, Logray the Ewok and assorted accessories (blaster, endor soldier rifle, endor soldier backpack, endor soldier helmet, staff, medicine pouch, spear and 4 display stands). We wish to express our thanks for everyone that played, appreciation to the generous sponsors and hope you’ll join us again on the next round – whenever that may be. We hope, in the process, that you also found something interesting that you didn’t know about one of our participating Unified Sites! In my opinion, Sigma Porcelains made some of the most unique and fun to collect items for the vintage line and today’s auction is no exception. The worrisome droid C-3PO known as Goldenrod, created and built by Anakin provides not only odds of navigating an asteroid field, but also is fluent in over 6 million forms of communication, including Huttese. 3PO is always getting into trouble, and subsequently gets dismantled one way or another. Today’s featured auction for a vintage Sigma picture frame pays tribute to 3PO’s predicament and attitude all in one! The frame, made of porcelain has pieces of 3PO’s body scattered about, all painted a nice bright yellow, with the word HELP! displayed at the top. The frame will hold a 3″ x 5″ photo perfectly and looks great in any collection! Gentle Giant introduces Star Wars Bust-Ups — mini bust model kits in scale to the Star Wars 3 3/4-inch action figure line. In “blind” packaging, Bust-Ups are available as a Single, a 6-Pack, a 12-Pack, or a Display Case of 24! There are six different Star Wars characters in Series 1 to collect: Ceremonial Luke, Ceremonial Han, Princess Leia, Chewbacca, C-3PO and Yoda. Only by purchasing the display case of 24 mystery Bust-Ups, are you guaranteed to have all six Series 1 Bust-Ups. Mark your calendars and reserve your copy today! The Official Site updates with news on the 10+ hours of Bonus Materials included with the Star Wars Trilogy DVD, most notably the Episode III Behind the Scenes Preview featuring The Man in Black – Darth Vader! Head over to starwars.com to check it out. Topps has been producing Star Wars trading cards since A New Hope was released in 1977, and has continued a tradition of nice quality cards with some interesting chase cards to keep collectors trading and scrambling to get a truly complete set. Of course, the newest set of Clone Wars cards are about to be released and with that I digress to the Attack of the Clones Movie Card set. The AOTC movie card set were normal sized cards featuring memorable scenes from the film, all with a beautiful high gloss finish. The chase cards in that set included prismatic cards, silver foil cards and panoramic fold-out cards. This featured charity auction is for one sealed box of 24 packs (7 cards to each pack) for the mere opening price of about 3 packs in any store. If you missed out on the set, or are just beginning to collect Star Wars trading cards today’s auction is a great place to start and help out a good cause at the same time. After purchasing the Red Leader X-wing, I was unsatisfied with the look of a cardboard R2-unit disgracing the socket of my new ship… so I decided to build my own. I just repainted the good ol’ 1995 Missle-Firing R5-D4 and hacked off it’s leg cannons and middle leg and presto! Along with the arrival of Episode I into theaters, Hasbro launched a new set of action figures which had the ability to “speak” through a Commtech chip. While the idea seemed good, the quality of the dialogue reproduction was not the greatest thing ever to hit the toy market. The Commtech figures were produced for foreign markets and were called Commtalk overseas. The figures did “speak” a foreign language, such as German like today’s featured auction. If you would like to have your favorite Sith Lord give you orders in German, then click on the link below. YakReader Dan was kind enough to send in this very nice photo of his Red Leader to show that the gun mounts are indeed correct (not backwards) and the wings when put on in order fit just fine. For the week of Apr. 18 – Apr. 24.
and more Jabbas in stock now. available at some future point in a 3-pack set. This week’s photo titled “Sleepless Knight” is of our favorite star-crossed lovers. Hyperspace members can view it at the The Official Site. Want More Collectibles From The Animated Clone Wars? The Official Site‘s latest post will whet your appetite. 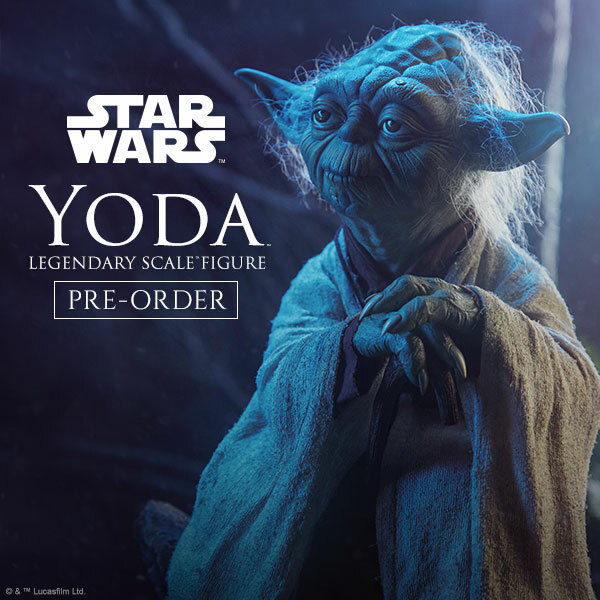 This time it’s Gentle Giant’s newest line– maquettes based on the Animated Clone Wars– Yoda, Obi Wan in Clone armor, Padme’s snow suit, and more. Check it out here. bunch of great new pre-orders and some new arrivals as well. pre-orders available. Takara has decided to produce more BT-03 and BT-04 figures for a June delivery. We have listed a new pre-order for the BT-03 Streak which recently has proven fairly hard to find in any quantity. Superlink pre-orders for the figures coming out in the next 3 months. Wave, and SD-15 Dark Fleet. Also available are the KT Collection figures – miniature PVC plastic ‘statues’ available in a box of 12 and also Transformers History PVC collection figures. NECA – MOVIE & TV FIGURES: NECA creates some great licensed items at very reasonable prices, new pre-orders include: The Crow 18″ Figure and ‘Reflections’ Mirror boxed set with 2 Brandon Lee figures. 18″ Freddy Krueger and Jason Vorhees figures. 20″ Aragorn and Legolas figures. Ghostbusters figures and Marshmello Man, Hellraiser Series 3 and Dr. Channard Boxed Set. MOTU Evil Lyn and Ram Man busts are also available for pre-order. TOYNAMI PRE-ORDERS: A variety of new items available from Toynami. InuYasha action figures series 1 and 2, Chobits action figures series 1, Macross Poseable figures series 1 – limited to 2000 sets so don’t miss out on these. Two new sets of I-Men available including Futurama and Voltron. MICROMAN: We’ve listed 2 great looking Batman Microman figures, one is the comic version and another is a newer flight suit version each $13.99 and arriving around the end of April. The Microman ‘Lady’ set of 4 will also be arriving at the end of April – we have a limited number of pre-orders remaining on those. DREAMS & VISIONS GI JOE: More great nostalgic releases from Dreams and Visions including 4 different ‘High and Tight Crewcut’ Joes: Marine Raider, Tanker Sargent, Navy Ordinance, Air Police. Also available is a new accessory pack for Sgt Rock and also the Unknown Soldier and an accessory pack for him. MUPPETS: 5 new exclusive muppet items have arrived bringing the total to 7 exclusives in stock. We have Invisible Spray Fozzie, 2003 Tour Edition Animal, 2 versions of Holiday Rizzo, Bunsen & Beaker Step Out, Advernture Kermit and Ghost of Samuel Arrow. A variety of normal Muppet items are also in stock. GI JOE BUSTS: More of the very cool Stormshadow Busts are back in stock. HERCULOIDS & DYNOMUTT: All 3 Herculoids sets are back in stock. Bandai Godzilla – restock of many sold out soft plastic Godzilla items as well as some new figures we’ve not had before. I myself have never been to DisneyWorld or DisneyLand for that matter, but a trip may be in the works soon so that I may be present for one of the Star Wars Weekends held in Orlando, Florida’s own DisneyWorld. Of the many promotional items produced for the Star Wars Weekends, the pins are among the smallest and most detailed. Collected not only by Star Wars fans but also by Disney fans, there are many varities of pins available at a variety of limited editions and therefore prices. Today’s auction is for a set of 5 pins in a special box adorned with the Death Star on the top. The character pins are all Empire related and include Vader, The Emperor, Boba Fett, Dooku and Maul. The pin set was limited to only 500 sets and is quite difficult to find. Click on through below to add this set to your collection today! Want One Of The Jedi Con Exclusive 2 Packs? Mint In Box has a contest to win one. Their site is in French, however it is user friendly. Click here to enter. This week’s Falcon Favorite sent in by YakReader Scott conveys a timeless message, one that we have all grown up with throughout the years. Don’t worry Scott, age matters not with a cool button and memories like that! Red Leader Gun Mounts Backwards? “I just took a gander at the loose pics of Red Leader at SSG and confirmed a problem with this. I assembled mine last night and it appears that the wing gun mounts were engineered backwards! The wings in the photo’s (SSG) show that they are on backwards, as this is the only way that you can assemble the fighter in order to get the guns to point forward. These were correct back on my loose Dagobah X-Wing, but are wrong on the Red Leader version. Only time will tell whether or not Hasbro will correct this, but until then Red Leader will be standing by. Action-HQ.com -Bringing the Best to you FIRST this week with Ultra Ewok & Skirmish at Carkoon! 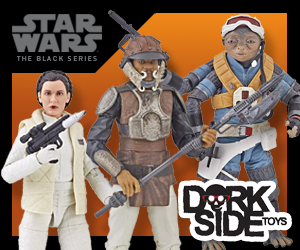 Get Ultra Ewok & Skirmish at Carkoon 4-pack available now starting at $20.95! Lando as Skiff Guard, Admiral Ozzel, Bossk, Captain Antilles, Dengar, Dutch Vander Gold Leader, General Dodonna, Tie Fighter Pilot, Ultra Jabba, Ultra Jango Fett & lots more starting at just $9.95! 12 NOON! (EST) Be There! 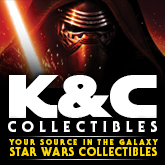 Today at Noon EST, 11am CST, 9am PST, the doors to The Star Wars Shopwill RE-Open. If you have time, stop in. There may be some good exclusive stuff up for grabs. 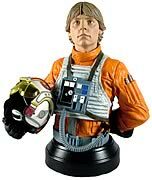 If you placed a valid order at StarWarsShop.com on March 10 and received an order confirmation email, we are reserving inventory of limited quantity products for you. We will recreate your shopping cart with the items in your March 10 order. Just visit www.starwarsshop.com beginning April 14 at 9:00 a.m. and click on the home page Clone Trooper banner that says “click here if you placed an order on March 10th”. You will be taken to a web page where you will enter your original Order Number from your order confirmation email. Your Order Number is the 10-digit number at the bottom of your order confirmation email. When you hit the submit button you will be transferred to your shopping cart where you can add or delete items, then proceed to check out. You will not be able to add more limited edition items than were in your original order. The Revenge / Return of the Jedi patch set and Topps promotion card sets will not be added to your cart, as they have already been sent to you. If you have a gift certificate from StarWarsShop.com, it may be used on this order. This service is available only for the first 48 hours of the shop re-opening. It will no longer be available after 9:00 a.m. Pacific Time on April 16. After this time, any unclaimed inventory on limited edition items will open up to the public. Each Order Number can be used only once. Please send an email to customerservice@starwarsshop.com with any questions. The X-Wing Fighter Red Leader is in stock at amazon and ready to ship. The next Q&A is on-deck and there are still some open spots. If you have a question, donations are being accepted here! Please give. The team over at Mint in Box.net has posted some nice photos of the upcoming Jedi Con exclusive 2 pack with the red clone and super battle droid. Check them out here. Now available for pre-order from shop.lego.com is the LEGO Falcon #4504 for $99.99, with a ship date of April 30th. Click on over to pre-order this one…. Check Out Our 8th Anniversary Sale! Gentle Giant introduces Star Wars Bust-Ups — mini bust model kits in scale to the Star Wars 3/34-inch action figure line. This display case includes 24 individually packaged Bust-Ups in “blind” packaging. There are six different Star Wars characters in Series 1 to collect: Ceremonial Luke, Ceremonial Han, Princess Leia, Chewbacca, C-3PO and Yoda. This display case of 24 guarantees that you have all six Series 1 Bust-Ups. The Deluxe Stormtrooper Collectible Mini Bust stands 6-inches tall and features a 3/4 representation of the Imperial soldiers of the Star Wars saga. This mini bust offers the same customizable features as the Clone Trooper mini bust, allowing you to change the arms, weapons and pose. Star Wars: Clone Wars has been a huge sensation on Cartoon Network, and Star Wars collectors will get to enjoy a series of maquettes (statues) based upon the animated versions of Star Wars Clone Wars characters! The second maquette will be Asajj Ventress! This Asajj Ventress maquette stands 9-inches tall. Limited Edition! Tattoos and Toys is celebrating it’s 2nd Anniversay today, April 13th. The site is the Web’s only and definitive home for Star Wars, GI Joe, Transformer, Super Hero and other misc. “geek” tattoos. To celebrate the anniversary, there are a number of new images to virtually every section of the site. Stop on by and view some very unique and personal skin art today! YakReader Cliff sends in this Ebay auction for a lot of vintage Kenner plush Ewoks, along with some bonus plush Episode I Applause Jar Jar and Watto. Don’t let the Jar Jars scare you away, the Ewoks are in very nice unplayed with condition, most are complete with their original paper Kenner hangtags. If you are looking for some nice furry Ewoks for your collection click on through to the auction below! If you enjoy collecting all kinds of Star Wars items including vintage foreign oddities, (like I do!) then today’s featured auction is for you! Today’s featured auction is for a vintage LP Soundtrack of A New Hope released in Germany. The cover art is not only different than US Cover with the Classic Style A Hildebrandt poster art, but has the main title in both German and English. This is a very reasonably priced item in excellent condition and something that I personally have not seen before. The auction ends in just a few hours so if you wish to add this LP to your collection today start your bidding now! We would appreciate it if you would take a second and cast your vote. What we are looking for, is to find out what you collect. Just figures? Figures and ships? Rare things (posters, ceramics, statues), or EVERYTHING! Let us know. You can Pre-Order yours today at Entertainment Earth. Gentle Giant Studios estimates this item will be released in November 2004. StarWarsShop.com — the official online store from Lucasfilm — will open its virtual doors on April 14 at 9:00a.m. Pacific Time. The online store will feature an extensive selection of Star Wars collectibles and memorabilia, including a record number of exclusive treasures that only Lucasfilm can offer. Also the first 500 orders will receive the Revenge/Return patches. You can visit the shop here. There were so many varied promotional items available in the late 70’s, when Star Wars was so new and different. Among the tie-in items were plastic cups available at 7-11, filled to the brim with frozen Coke or Cherry flavored syrup-y Slurpee goodness. Throughout the release and re-releases of Star Wars from 1977-79, three sets of Slurpee cups were produced. Today, the sets are not the easiest nor the most inexpensive things to complete, with the most difficult and most expensive being the original numbered set of 20 which had no logos, only basic character designs and memorable scenes. The subsequent sets of 8, then a set from 1979 of 10 are somewhat easier to find and generally less expensive. Today’s featured auction is for the 1979 cups of which 7 different designs are available with some duplicates, as well as the coolest cup from the set: our favorite Bounty Hunter Boba Fett. The cups offer bold colors and eye-catching graphics which really add to any display. Click on through below to get your vintage Slurpee cup collection started today with this affordably priced auction! Due to popular demand and a genuine need for collectors and Star Wars fans to solve this mystery, the Unified Site Contest III is being extended for one more week! Entries MUST be in by 8.00 pm CST April 18th. Within the pages of the unified sites you will find clues to solving the greatest mystery of the Star Wars Universe: the death of Jabba the Hutt. It’s a Star Wars “Infinities” murder mystery where you assist Ephant Mon (Jabba’s trusted confidant) in determining the guilty party among a long list of underworld cutthroats, criminals and hooligans. Find the game pieces that will lead you to the suspects, then make your determination and incriminate the culprit! And what Unified Site Contest would be complete without a large cache of bounty to be won! 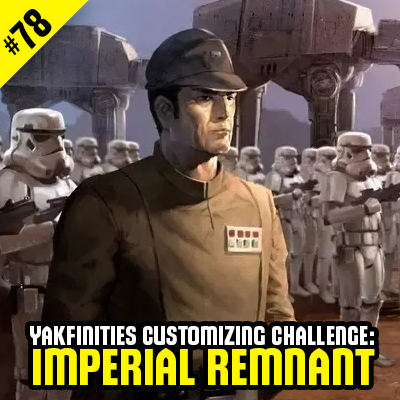 Our newest contest has THREE prizes levels culminated from the generous sites and sponsors of AllTroops.com, The Bothan Spy, Snowtroopers.ca, Jedi Temple Archives, Yakface’s Realm, The Custom Alliance, FFURG and Rebelscum.com! For more information on rules, game play, prizes and more, visit the Unified Site Contest III gamesite. Hasbro’s Latest figures are now in stock! General Madine Imperial Shuttle Capture, Han Endor Strike (AT-ST Driver Outfit)and Lando Death Star Attack (General) are all in stock. New reduced prices on some of the latest saga figures like Admiral Ozzel, Captain Antilles, Luke Hoth Attack, Lando Skiff and more. Jedi Council #1 now back in stock. Don’t miss out of getting your saga action fleet, Slave 1, Republic Assault Ship and Republic Gunship are still available. Don’t miss out on this week’s POTJ and EP1 featured items including variations, vehicles and anniversary figures. Now in stock the Superlive Jedi Lightsaber with Gold Handle! Lots of POTF2 Beast Assortments in stock now including Han and Taun Taun. Just in and added to the site, a set of Suncoast Pictures Statues including all your favorite Star Wars characters. A nice selection of vintage loose figure now in stock, be sure and check out the POTF section. Don’t miss the rare 3-packs we just got in stock in the foreign and rare carded section as well. There is nothing better than drinking that morning cup of java out of your favorite star wars character, check out the great Sigma mugs in stock now! We’ve just updated our Diorama Section with Ruf Terrain’s outstanding Dagobah Diorama. Check it out here. Please join us in congratulating Ruf on his outstanding work! Federation Toys now has the Hall of Fame wave as well as a number of hard to find Clone Wars items, including Durge on Speeder and Clone Trooper on Speeder in Stock. Click on over and be sure to tell them Yakface sent you. Warm up those VCRs, TIVOs, or whatever other recorder your prefer, tonight starting at midnight eastern, the Cartoon Newtork will be showing both seasons of the Clone Wars microseries! It’s all there. You already have all of the Silver 25th Anniversary figures and to add to that you can accessorize yourself with your very own 25th Anniversary Star Wars Logo baseball cap! The hat has a nice large embriodered 25th Anniversary Star Wars logo that will definetly set you apart in the crowd while waiting in line for Episode III in 2005! Stay on Target…rather your local TRU as Red Leader lands in stores and on doorsteps! Don’t forget to set your VCR or TIVO to record the Cartoon Network tonight! They will be showing all 20 episodes of The Clone Wars Cartoon tonight (starting around midnight eastern time – check your local listings for exact time!). In case you missed it, the final chapter is now available for download fromstarwars.com and all I can say is – I CANNOT WAIT FOR EPISODE III!!!! Is That a Star Wars Special Edition, Special Edition? Well, it has been rumored that there will be additional changes to the Original Trilogy when it is released on DVD this fall. This could be the first of many reports that show what has changed! The Digital Bits has a supposed photo of the Emperor from The Empire Strikes Back. In the changed version, we actually have Ian McDiarmid as Palpatine. Head on over to check it out! Thanks Brad for pointing it out. Now available for pre-order are the following new TRU 4-Packs. These are scheduled for Fall of this year. The Clone Trooper 3-pack is back in stock. The Official Site has just updated with the first pics we’ve seen of the convention Silver Sandtrooper! Unfortunately it looks like this is another sprayed figure instead of the chrome we saw on Vader and R2. Check out the pics here. Vintage patches are very interesting, with well-done graphics and bright colors that look great on a wall with vintage figures. They are small, easy to display and can be rather hard to come by in unused condition without paying a premium price today. The auction spotlighted today is for a Kenner ESB embroidered patch, featuring our favorite Dark Lord of the Sith, Darth Vader himself. While most patches produced in the vintage era were distributed either through the Fan Club with membership packs, or were made by Factors Inc. and could be bought at stores, the Kenner patches are not as common. Kenner gave them away as prizes in a sweepstakes, and this awesome Vader Patch was the Third place prize. The patch in the auction today is unused, sealed in the original bag with a very reasonable Buy-it-now price. If you collect Kenner items, this is a must have! Thanks to Dan for the heads up on this one. He ran across THIS ITEM on Ebay that is for the 2004 Disney Star Wars Weekends poster. Very nice! The poster is just like the original Star Wars Poster that had Luke with his lightsaber held high and Princess Leia at his feet. Except, this time substitute Mickey and Minnie for Luke and Leia. The Official Site has just unveiled the official logo for Celebration 3– Vader in flames! Check it out here. Oh and they also confirm we’ll have an exclusive figure at C3 too! 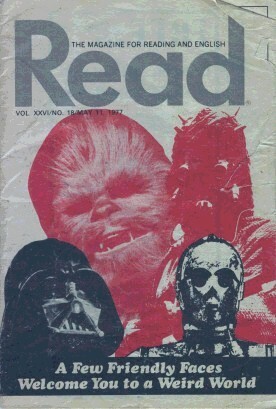 In this week’s Falcon Favorite, YakReader Joe J. from Lake Orion, MI sends in a small, early obscure little paper magazine called Read from 1977. Though the magazine may not have been totally accurate in its descriptions of the vehicles and droids, the early images were so fantastic everyone only wanted to see the film itself. “I still have the very first Star Wars item I ever laid eyes on. I was in 5th grade. The school year had come to an end and my brother and I went off to summer camp for a week. While there, a small magazine was handed out called Read. On the cover were these weird and wonderful creatures that caught my eye. I read the article inside. It told about an upcoming movie that featured space battles and colorful characters. I tried to imagine the story from the photos in the magazine. “Was that golden robot trying to keep them from getting on that big spaceship?” I couldn’t wait to get more information! First I bought the Star Wars Marvel Comics. I still remember pulling into the movie theater’s parking lot and seeing Star Wars on the marquee. I was so excited! Of course, the movie floored me and I saw it many, many times as a kid. Thanks for the great images and story, Joe. I know I wish I still had my very first Star Wars item, which was a Read Along Record and Storybook, but sadly it was sold by my mother at a garage sale.(gasp!) I was able to get another one, but there’s nothing quite like having that first Star Wars item from when you were young and couldn’t wait to see what would happen to Luke, Han and Leia. CelticsFan writes in to tell us to keep an eye on our mailboxes for the new 2004 Fan Club Kits which are starting to arrive. Customizers will enjoy a couple of photos posted in The Official Site’s Hyperspace Section the first is a conference room from E3, the second is two Imperial Officers from the bridge of a Star Destroyer. 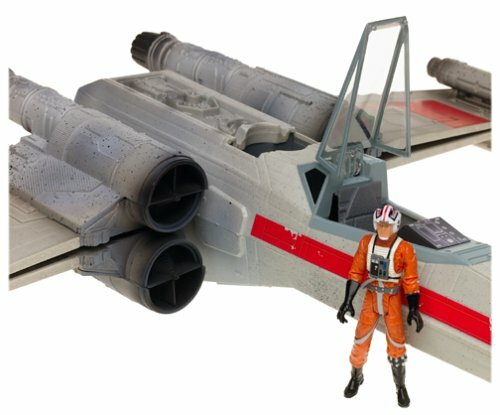 There have been reported sitings of the Red Leader X-Wing (Pre-Order at Amazon, released date April 15th) being spotted in the US and Canada.Rebelscum has received confirmation that it is out in Canada, and GalacticHunter has word of the US release. Also the Clone Trooper 3-pack is back in stock. Rebelscum has reported that the Official Site’s Cargo Bay has listed a variation of the Unleashed Clone Trooper, with Red markings. If you have seen this in stores or you have one, let us know. If you are having problems finding the Deluxe Kamino Confrontation Obi-Wan Kenobi and the Deluxe Kamino Confrontation Jango Fett figures. Amazon.com has them in stock and on sale for $9.99 each. As announced on the official site, Gentle Giant will be releasing two new mini busts, one of a highly poseable Stormtrooper and a Luke X-Wing oufit. The Stormtrooper will be released on August 25, while Luke will be released on September 22. The edition size has not yet been determined, but these busts keep getting even better and with all the different arm/hand options even more collectible. You may read all the details here. As the Silver Clones have arrived, so have the reports of damaged bubbles and cards, in some cases from Amazon, but in most cases from Toys R Us stores themselves, which seems to be hit or miss. “I ordered from Amazon as well since the closest of the TRU stores to me doesn’t have anything worth buying to get one free. I ordered six and an ultra Jabba the other day, and they arrived today. I ordered that many as a gamble hoping that I’d get two in good shape for my collection. Unfortunately, it didn’t pay off. Only one out of the six was in nice shape; the other five had varying degrees of bubble damage. I was especially appreciative that they put big old Jabba on top of the clones when shipping…Way to go morons! I received the 2 Clone Troopers I ordered from Amazon in the mail yesterday, and I found them to be packed very well with airbags on top so the cards wouldn’t be damaged. Perhaps I was one of the lucky ones to get nice mint cards and bubbles, but overall I am pleased with the figure and even more pleased I could buy them outright for $4.99 each. Looking for a chance to see the all 20 episodes of the Clone Wars microseries together, well the Cartoon Network will come very close this Saturday April, 10th. Starting at 9:00 p.m. Eastern, every half hour, 5 episodes of the micro series will be shown — that’s the whole sries by 12:30 a.m.! It’s over a year away, however we now know when the final installment of the Star Wars Prequels will open in US and Canadian theaters. The Offical Siteannounced that May 19, 2005 is the date. Read the full story here. Interested in buliding your very own R2 unit and live in the Washington, DC area? You’re invited to the upcoming R2DC event on Sunday, April 25th. Astromechs. We will have discussions, demonstrations, displays of parts and systems, as well as, completed droids. In addition, members of the 501st and the DC Star Wars Collectors Club will attend. It should be a great time for anyone interested in building R2. Please check out the website at www.r2dc.com for more information about the event. Ordering from the website, in my opinion, is the easiest way to obtain this figure and also the most cost effective considering there is free shipping. You can now get the silver clone trooper free with any purchase of Star Wars Toys of $14.99 or more at your local Toys R Us store – or you can purchase online from Toys R Us.com. At Checkout, you just need to enter the promotional code PSTRWRCLNTRP to get the free figure. See What’s In Stock and Coming Soon at Entertainment Earth! The long awaited second Vader statue is coming soon! The Attakus Collection has always provided the highest quality Star Wars statues with the greatest detail. Their second Darth Vader features this Dark Lord of The Sith holding his lightsaber and stands approximately 17-inches tall, is in scale to all of the other Attakus Star Wars statues. Limited to 1500 pieces worldwide! Coming Soon! The Slave 1’s cockpit rotates as it goes from flight mode, in a vertical attitude, to a landing position with its engines down. You can also rotate Slave I’s wings and short range twin blaster cannons. With your model of the deadly Slave 1, you also receive a customized display stand and base, Boba Fett’s bounty hunter patch, a specialized magnetic tool, limited edition certificate and Han Solo encased in carbonite. 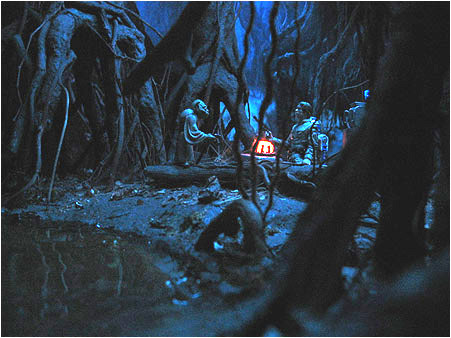 YakReader Ruf shares with us his well-built custom diorama of Yoda’s slimy mudhole on Dagobah. You too may build this diorama by following Ruf’s step by step instructions by going to his website here. Back in 1985, the final chapter in the Trilogy had been released 2 years ago, Kenner was near the end of producing toys from the Trilogy and we were swept up by Ewoks marketing at its best. The cute shrunken little teddy bear furballs not only had their own cartoon, but 2 TV Movies as well. Today’s featured Ebay auction is an unusual item, a relic of Ewok-Mania: A Roll of Ewoks Wallpaper. I am always very careful in using the term “rare”, as its overuse everywhere, including Ebay can be tiresome and in some cases not truly applicable to the item up for sale. Today’s wallpaper is an exception to that rule, not simply because it is an item I have never seen or heard of, but is not pictured in any of the books that I have in my possession. Not only is this wallpaper a rarity, but also an oddity, something not likely to be found in many collections. Click on through to see this roll of sealed vintage Ewoks Wallpaper and add it to your collection today! 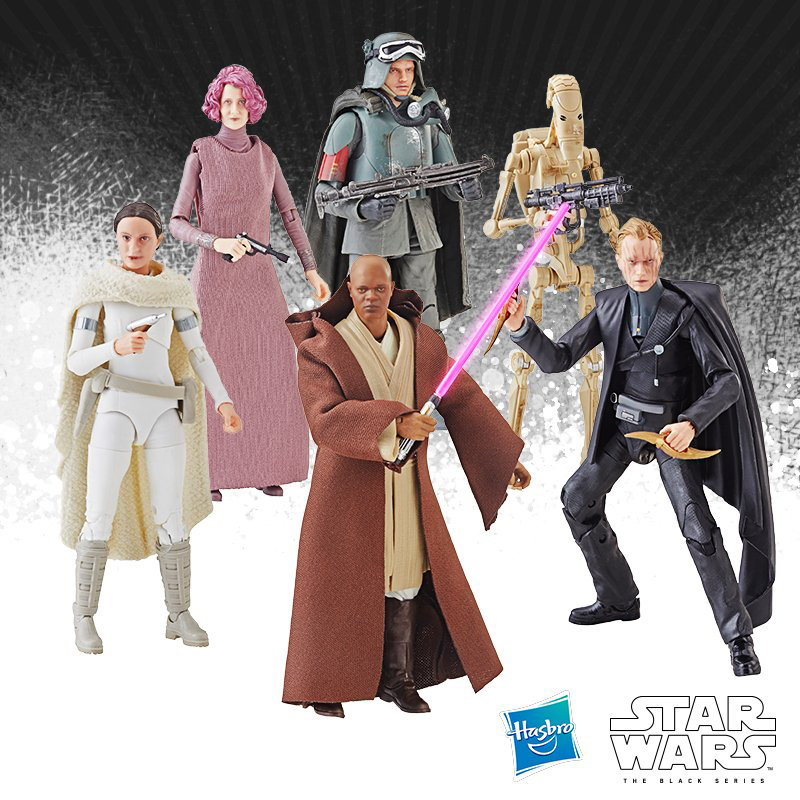 It seems that there are more questions, rather than definitive answers on the Series 2 Cantina Sets issued by Hasbro to be Wal-Mart Exclusives. After searching and reading upon the topic from various sources, I hope to have come up with some answers to help myself and our readers clear up this muddled mess. As we know, the First Cantina Sets were Wal-Mart exclusives, and in most cases were pretty much deluxe peg-warmers. In fact at some out of the way Wal-Marts in my area they can still be bought, although not of course not on mint cards. 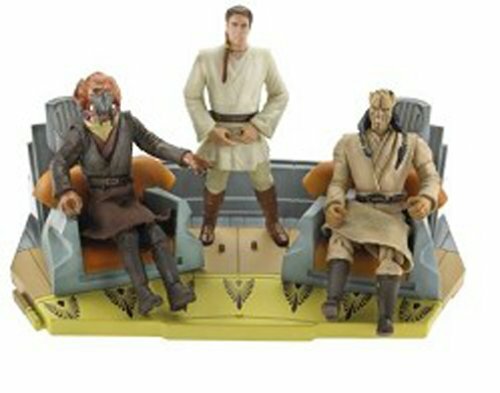 The Second Cantina Sets slated to be released at Wal-Mart were Dr. Evazan, Kitik Keed’Ka, and Wuher. However, Wal-Mart declined the exclusive items, which were in turn picked up by the struggling K-Mart. When K-Mart declared bankruptcy and started closing stores, Hasbro stopped production on these figure sets. How many cases exactly did Hasbro produce? According to Cloud City Collectibles, the only US Retailer to actually get cases of these figures, the number of cases believed to be produced is somewhere around 250, which translates into about 1,000 Kitik’s and 500 each of Wuher and Dr. Evazan. Therefore, the prices for these figures on the blue Saga cards are not in the low end of the spectrum. Where exactly does that leave us now, those who do not wish to pay a small fortune just to own the figures? As we have seen, the figures are still a K-Mart exlusive, this time appearing as a 3-Pack in the new OTC Packaging design. The point being, unless you absolutely must have every single packaging variant produced, I would say be patient and wait for the K-Mart 3-Pack. You may view the figures with their Blue Saga cards up for auction on Ebayhere. Star Wars – The Original Trilogy Collection 3 3/4 inch Basic Action Figure Assortment Wave 10. 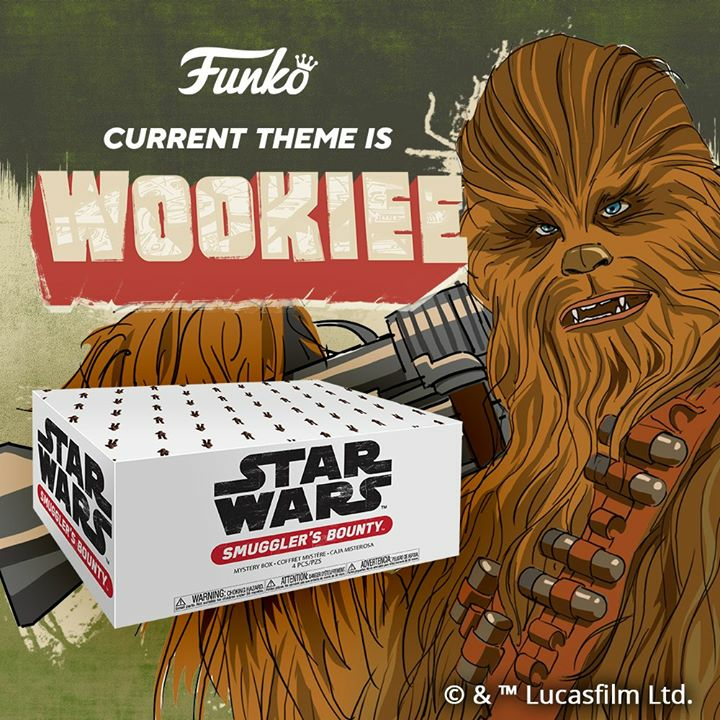 Includes all-new vintage-style packaging that resembles the original line of Kenner Star Wars Action figures. Contains 12 individually packaged action figures including 2x Greedo (NEW), 1x R2-D2 (NEW), 2x TIE Fighter Pilot (NEW), 2x Luke Skywalker – Bespin Outfit (NEW), 1x Luke Skywalker – Dagobah, 1x Luke Skywalker – Jedi, 1x Yoda – Dagobah, 1x R2-D2 – Dagobah Swamp, 1x Wicket (subject to change). All information and descriptions are subject to change. More details coming soon! Figure Assortment Wave 9. Includes all-new vintage-style packaging that resembles the original line of Kenner Star Wars action figures. Contains 12 individually packaged action figures including 1x Princess Leia (NEW), 2x Biker Scout (NEW), 1x Luke Skywalker – Dagobah, 1x Yoda – Dagobah, 1x Spirit of Obi-Wan Kenobi, 1x R2-D2 – Dagobah Swamp, 1x Luke Skywalker – X-Wing Pilot, 1x Luke Skywalker – Jedi, 1x Han Solo, 1x Chewbacca, 1x Darth Vader (subject to change). All information and descriptions are subject to change. More details coming soon! Each at just $9.95 and up! Hut, Ultra Jango Fett (New Card) and Ultra Obi-Wan (New Card). And in the next week or two Ultra Ewok. toys, anime & other collectibles the show will also be featuring artist Ron Lim, a video game tournament, a charity auction, & many other events. For more information on the show check out at the web site here. As of right now there are 67 Star Wars items listed in our Great Deals section:here Everything there has already been marked down…. But guess what? Customers can take an ADDITIONAL 30-40% off items on the list with their anniversary sale! Check it out! After seeing the price drop on the Silver Clone Trooper, I emailed amazon.com and asked them about this, as I myself, ordered it at the $5.99 price. This is their response…. Thank you for writing to Amazon.com. time you placed your order. credit on your next billing statement. bottom of an individual order’s summary page. Amazon.com–we hope you will visit us again soon. So if ordered this fig at $5.99, make sure you email them now. 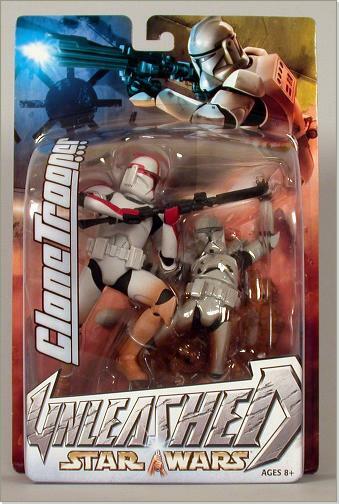 Star Wars: Clone Trooper Figure $4.99 Free shipping, in stock and ready to ship! While this isn’t a new Star Wars item, Master Replicas has once again produced a hit with their new “Shrek” line of limited edition busts. Those of you that are collecting the Gentle Giant line of Star Wars busts may want to check these out from Master Replicas . Its been a rumor floating around for a couple of weeks now. But, its either an April Fool’s Day joke or the real thing. Head on over to StarWars.com and move your mouse over the menu on the left. Check out what is listed for Episode III……if it is true, looks like George is keeping with his “Saturday Morning Serials” titles. Thanks to Scott E for noticing this. Wanna Hear George Talk About ANH? A New Hope is coming to DVD this fall, but you can listen to part of the Audio Commentary from George Lucas RIGHT NOW!!! Visit this website to listen! Back in 1981, when your Mom forced you to wash your hair, the only shampoo you could have ever wanted near your hair had to be the Star Wars characters produced by Omni Cosmetics. Today’s featured auction is for a nice mint sealed example of an R2-D2 Shampoo bottle complete with original tag. If you are looking to start the bath section of your collection, this is a great way to get it underway today! Now you can get it… It’s back in stock…. Yak Reader Danielhubby wrote in to give everyone a heads-up on an editing error on the back of one of the figures in the Star Destroyer wave. On the back of Bossk’s card the “name” under J’Quille’s photo is Tanus Spijek! Interestingly Admiral Ozzel’s card doesn’t seem to have the error.